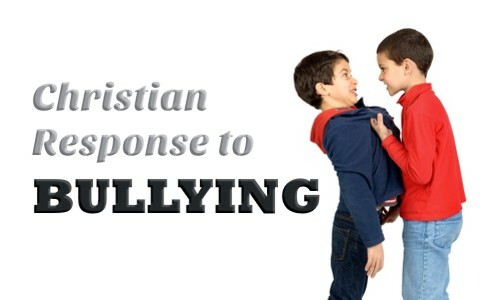 How Should Christians Respond To Bullying? Schoolyard bullies, workplace bullies, family bullies…it seems bullies are everywhere. What should be the Christian response to bullying? I remember being bullied in elementary school. Every school day, I dreaded getting up and going to school. It didn’t help that my mother enrolled me in kindergarten when I was only 4! That meant, for all my school years, I’d be a year young than all my classmates, so that didn’t help. I lived in fear and was constantly looking behind me on my way to school. I feared the schoolyard bully would pop out of the bushes at any moment, or spring out from hiding from behind a car (which he had done before). I felt it robbed me of my childhood in a sense, and I’ve heard others say similar things, so what’s a child to do? If they tell the teacher, will that actually make it worse? In my case, I kept silent. I believed the bully’s threats that if I ever turned him in, “I’d paid dearly.” So what should I have done? The bully you know could be your next worship leader. Even bullies have hope of becoming a new creation in Christ (2nd Cor 5:17). I was not a believer as a child. I knew about God but I didn’t really know God. I had heard of Jesus but I didn’t know Jesus. I knew about Him but I didn’t have a personal relationship with Him, so it would have helped me to know Jesus when I was a child so I didn’t feel I had to go through this alone, but when you encounter a bully at school, pray for them. If he or she is your enemy, then pray for them because Jesus tells us to, “Love your enemies and pray for those who persecute you” (Matt 5:44). Maybe we should look at ourselves and ask, “Did I embarrass them at one time? Have I been rude to them? Do I speak badly about them behind their back?” This is something that all of us should do; we don’t want to be a cause of offense to anyone, and not everyone we offend will tell us. We might not even know it. It could have been a promotion you received while another co-worker was left out. Things like this can create friction between relationships and when there is pain, there is usually a response that is negative. We don’t know what that person (the bully) has going on at home. Maybe there is health or financial issues. For a child, maybe his father has abandoned him (which was the case with my bully). There is an opportunity here to show Christ. We can sincerely ask how things are going. We can do them a favor or ask them out to lunch. Maybe no one’s ever done that for them. A person who lashes out is often a person in inner turmoil. There may be years of pain, suffering, and hurt that they can’t deal with, and if they’re outside of Christ, they are not going to be able to do very well at all, because they’re depending on their own strength. We know that doesn’t work, so pray for them and do good to those who bully you. We are more like the sons and daughters of God when we do good to our enemies (Matt 5:45). This can be a point of contention for Christians. Many say we are to “turn the other cheek” (Matt 5:39), but the context of that teaching is about persecution and personal insults, not about being physically threatened. That’s something altogether different. If a Christian is being threatened physically or has been abused physically, they have every right to contact the authorities. That’s doing what we are commanded to do (Rom 13:1-5), and if we don’t, we are actually condoning it by excusing it. This won’t help the next person who might get hurt even worse. We are not punching bags and should pray for those who physically abuse us. If we are able, we should defend ourselves, but either way, this must be reported. God executes justice, not through revenge, but through those whom He has ordained (Rom 13:4), and we don’t want to be found resisting God’s authority (Rom 13:1). Do you know of someone who has trouble with a bully? I don’t mean a schoolyard bully like I had, but someone who is a co-worker, boss, employee, family member, or even someone in a church? Bullies exist everywhere and they are sometimes hard to uncover. There are several signs of being bullied by someone; there is admission of doing wrong when in fact, the person’s not at fault at all; there is depression and overly –submitting to the bully in a state of despair and surrender; there is an inordinate number of favors done for the bully that no one else receives; there is mental, emotional, and sometimes physical marks in the person being bullied; and most of the time, there is no “whistle blowing” because they are fearful of the repercussions. Today, bullying can be online, in the family, at work, at school, or just about any place you can think of. All the Christian can do, besides pray, is to bless them who curse you; do good to them that do bad to you; pray for them that despise you; and love them that hate you. Maybe they’re hurting. Deep down inside, a bully is surely not a happy person. They might be hurting inside for some reason that we don’t know about. Maybe you can befriend them and ask them about their life. Perhaps they’ve never had anyone show that they care. Maybe they just need someone to listen. Take the time to do good to the bullies, and understand that only God can change their heart (Prov 21:1), but He may use us as a means to do that. First of all, every bully (every person) needs Jesus Christ. Until Jesus Christ comes into their life, they have no way to deal with life other than bully people, but the person you may think is the least likely one to be saved, may actually turn out to be someone like the Apostle Paul. Even Saul became Paul after God was done with him, and he and his missionary team changed the world. The least regarded in this world are those who God will often call. The bully you know could be your next worship leader. Even bullies have hope of becoming a new creation in Christ (2nd Cor 5:17). That’s something we can pray for, isn’t it? Read more on this topic here: What Does the Bible Say About Bullying? Previous post: How Can We Receive The Peace Of God?